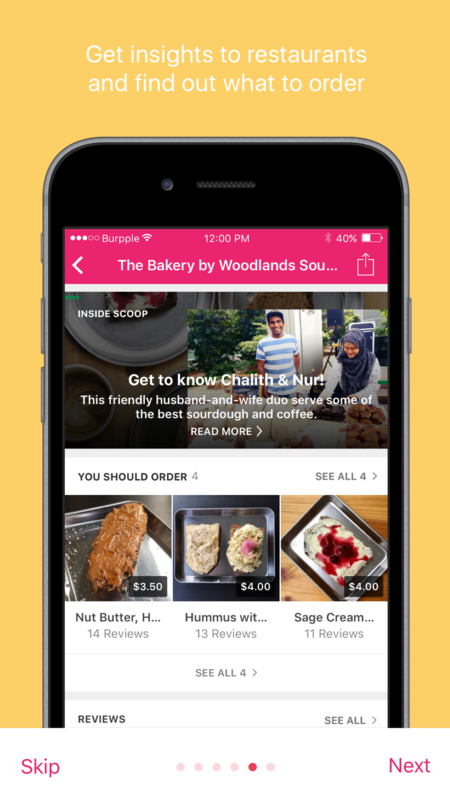 As compared to many other startups in Singapore, Burpple is one that’s more conservative in terms of its updates. The last we heard from them was April 2017, when they announced that on top of food reviews, they were going to let users make reservations at over 1,800 restaurants without leaving their app. Their partnership with Honestbee also meant that takeouts can be made from more than 2,000 locations by booking directly from the new app and website. Burpple also dipped their toes into content creation, and crafted articles featuring inside scoops on F&B business owners’ stories and aspirations, so that foodies could get an insight on the teams that cooked their lunches and dinners. 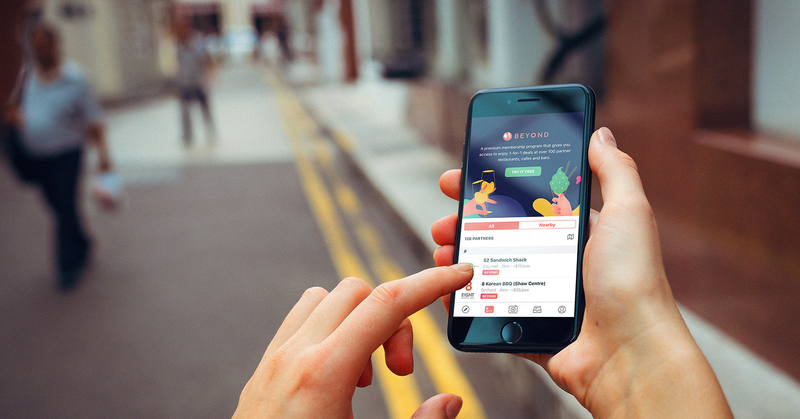 This news came after an interview we had with them back in 2016, when founder Dixon Chan revealed that the team was “working hard to make the platform more than just a place for recommendations” after their US$6 million Series A funding in December 2015. Now, the team is indeed back with a new update, and also what seems like a means of further monetising their operation. 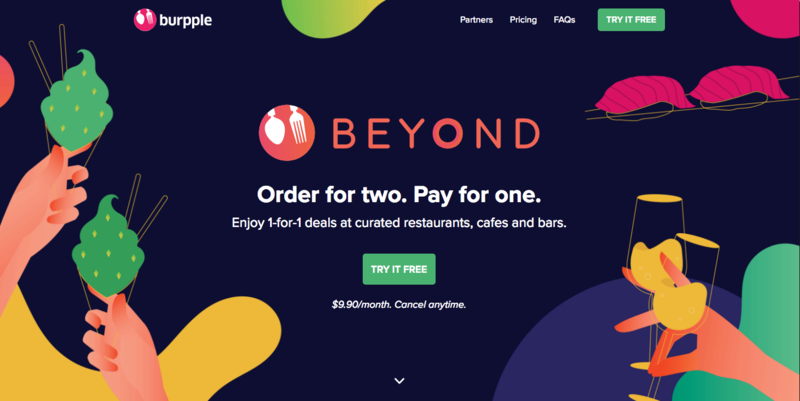 Named Burpple Beyond, it is a premium membership programme which lets Burpple users enjoy 1-for-1 deals at over 100 partner restaurants, cafes, and bars. Some notable partners include Chir Chir, Park Bench Deli, Creamier, The Dark Gallery, Founder’s Bak Kut Teh, EIGHT Korean BBQ, Vatos Urban Tacos, and many more. On average, members are expected to save an average of $22 per redemption. Burpple Beyond also offers two memberships: All Day and Off-Peak. The All Day plan lets members use the deals (as implied) all day, and comes with a monthly fee. The Off-Peak plan is limited for use during off-peak timings, which are predefined by restaurants themselves. As a launch special, the All Day plan is a monthly fee of $9.90 (usual price $12), and the Off-Peak plan is free of charge (usual price $4). Members are also charged monthly, and have the flexibility to join or cancel their subscription any time. Burpple promises that “new restaurants, cafes and bars” will be regularly added to the list, and partners who are no longer participating would also be removed at the end of every quarter. Building on our relationship with both customers and businesses, we have this opportunity to solve both needs and challenges at scale. When asked if he faced any difficulties in convincing merchants to come on board, Dixon revealed that merchants were concerned about the redemption experience, as “they wanted it to be simple for customers while also easy for their staff to manage”. Another challenge the team faced was for the setting of ‘peak’ and ‘off-peak’ hours for business. Standardisation would not have worked for most cases, which led to our decision to give partners the flexibility to define their off­-peak hours, while setting in place mandatory peak periods (12–2pm and 7–9pm). More than just giving F&B establishments a higher likelihood of footfall during off-peak periods, when business can come to an excruciating crawl, Burpple Beyond partners can also receive “marketing advantage”, data on how they are performing based on user feedback, and also dedicated team support from Burpple. How Does It Compare To Competitor The Entertainer? 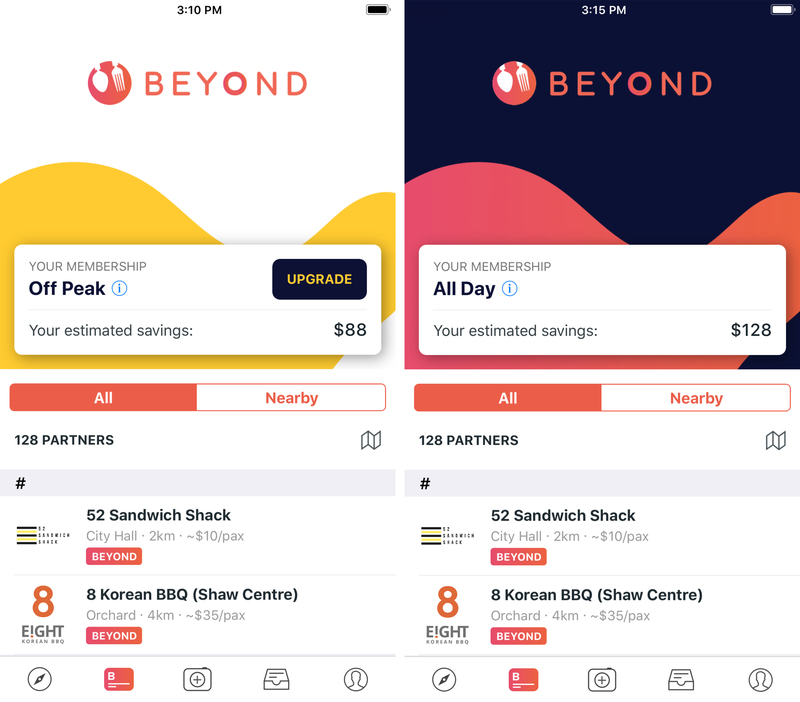 Honestly, when I first heard about the Beyond membership, I was immediately reminded of deals app The Entertainer, which, for $75/year, gives users 1-for-1 deals at partnering establishments. I asked Dixon about how Burpple Beyond is distinguishing itself from their more established competitor in the deals market, and he shared that it’s the flexibility that Beyond provides that makes it stand out. Beyond partners also offer 4 redemptions each, one more than The Entertainer’s 3 redemptions. I think it is important to emphasise that Burpple Beyond is an extension of what Burpple stands for. 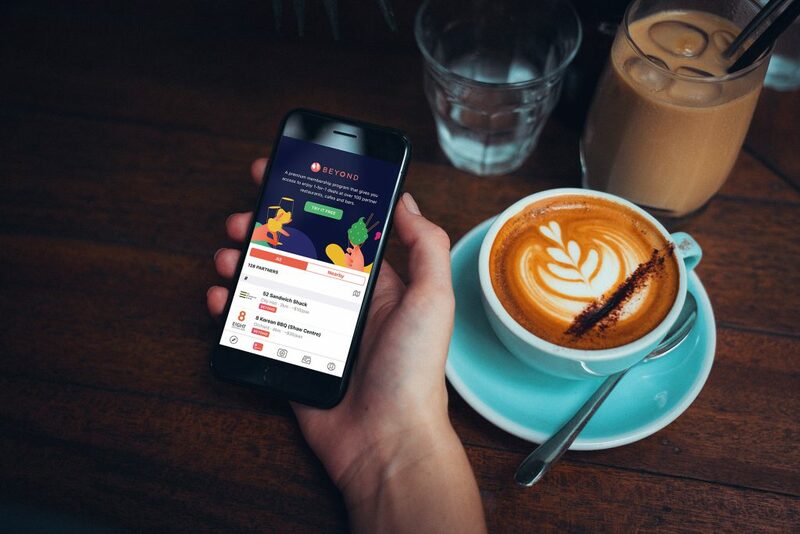 With 1 million users in Singapore coming to Burpple to find a place to eat monthly, Burpple Beyond is the next step to bring even more value to these users. 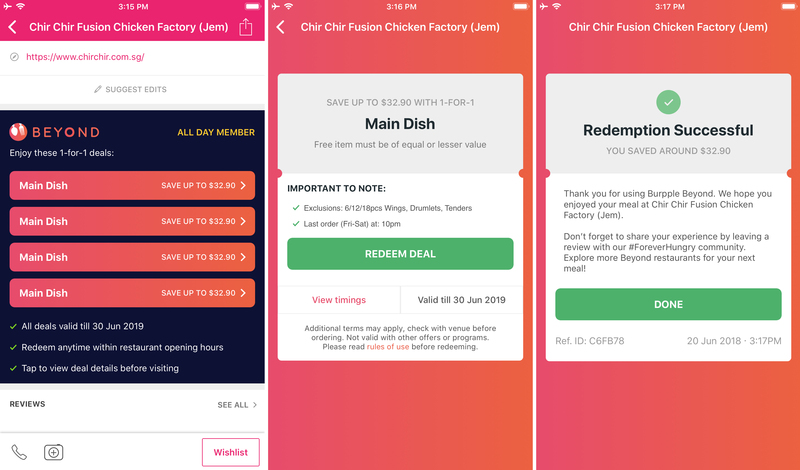 As for what users can expect from the app, Dixon shared that they’ll be adding more partners regularly “so the membership value will continue to grow at no extra cost”. Starting 3 July 2018, Burpple Beyond will be available at over 100 partner restaurants, cafes and bars across Singapore. Between 26 June and 3 July 2018, users can join the waitlist on www.burpple.com/beyond to enjoy your first month membership for free. This is limited to the first 1,000 activations, so #dontsaybojio.